Whitewater, Blue Death Ambergris Caye, Belize On the Road to Curacao I went to Canada! 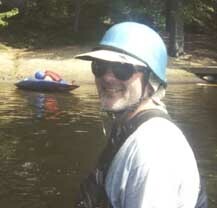 Learning to Whitewater Kayak Again with the Canada! 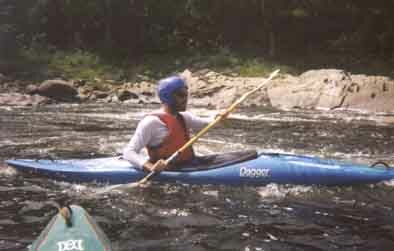 Again with the Kayaking! Go Deep Cape Hatteras Doing it OK! Gettin Hitched Who is Dan the Man? Who Really Rules the World? 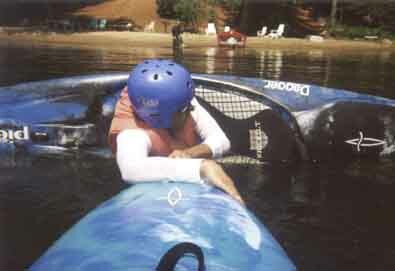 Not two weeks after my Ironman I went to learn how to whitewater kayak. Jogen was my compatriot. Our venue was the Hudson Valley River Gorge, which resembles the Hudson down by Manhattan, the way Cajuns speak French (meaning it would take an expert to prove it). Now, this is the front. You go this direction. It was beautiful and clear. And we got to go on it the second day. But first be had to learn a few important things. Like how to get out of the damn thing should it flip over. I was in favor of this (both the turning over and the getting out). This we did in a large lake. Our instructor was a genial man named Rick Morse. He lived across the street from the WWOC. His backyard was a put-in for the river. Nice. He also knew his stuff, and was adept at communicating it. Guess which boat Jogen is in? We learned how to wet exit. This involves taking the kayak off like a pair of pants while upside-down underwater. I'm cool with being underwater and I know what I can do in the breath-hold department, but this can be unnerving for folks used to being dry. Suffice to say, you (I mean you, personally) could hold your breath for almost 15 seconds, even after a deep exhale. With even a partial breath, you could last more. This is several multiples of what you'd need to wet exit. But, this is where we get that skill dialed in. So that we can do it quickly later. While rushing down the river upside-down, dodging submerged boulders and trees. Like I said, I was all for it. We progressed from there to the eskimo rescue. Not roll. Rescue. In this, you first learn (or in some cases are told about and never master) The Hip Snap. The whole point here is to avoid a wet exit. Yes, we just learned it, but we want to avoid deploying it if at all possible. It should be a last resort. Which is why it's taught first. No sense getting to the last resort situation and not having a last resort tactic, right? Right. I lend Jogen my bow so he can breathe again. So, you're upside-down, still wearing your kayak like an extra-stiff pair of novelty parachute pants from the 80s. You don't want to wet exit. Well, you might, but you resist the urge and instead use your hands to pound on the bottom of your kayak. The part that is dry and sunny. This sound alerts your comrades (you aren't out here alone?) that you need something to hold onto. One of them slides his nose along your side and you feel it. You grab it and snap that hip. Up you come out of the water. Voila! This Hip Snap is the same key skill needed for the eskimo roll. Roll. You flip over and, instead of exiting wet, you roll back up. Cool. I wanted to try, since I had a good snap in the rescue practice. I was tantalizingly close to rolling on the first day. I only got about 15 minutes of work on it, but it was enough to know I'd try again tomorrow. Oh, and we learned how hard it is to paddle straight in a river kayak. Sunday we were on the river. A small, barely flowing portion of it, but it wasn't a lake. We learned about ferries, eddy turns (named after this guy ... :) and peel outs (which do convey the whee! factor of turning your nose into the current and letting it sweep you away). Unfortunately, Jogen bashed his knee mid-day and had to watch from the riverbank. We moved after lunch down to some actual moving water. Class 1 water. Easily avoided hazards and lots of places to rest. Here we practiced the eddy turns, peel outs and ferries. We also played the shark game. It was a bit different in the river than the lake yesterday. The current was a factor. One person starts as the shark. Others attempt to cross the river and avoid being tagged by the shark. If you are tagged, you become a shark (should have been called vampire, but I digress) and help hunt the rapidly dwindling number of uncaught crossers. I lost every time. I did, however get to practice the roll near the end. Rick was working with me. In the roll, your aim is the same as the rescue. 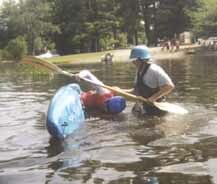 Only instead of someone's boat, you will push down on the surface of the water with your paddle, and snap that hip. It puts a premium on a good snap. I did it. Rick congratulated me and cautioned me that I didn't really "have a roll" until I could do it 10 times in a row. I proceeded to roll constantly for the next half-hour. I rolled 25 times in a row. I rolled repeatedly in class 1 current. I rolled for the sheer joy of rolling. I almost managed an off-side roll (to your weak side). I was a rolling fool. There will definitely be more of this next Summer! 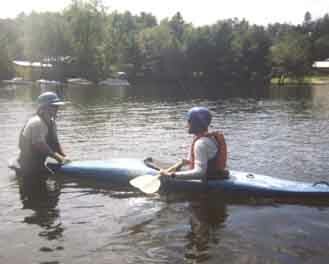 Call Wild Waters Outdoor Center in Warrensburg, NY.